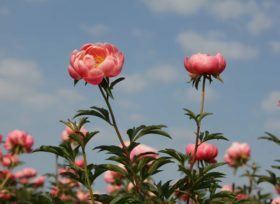 The secret of growing the perfect peony is in the heart: our growers are passionate about peonies! In addition to skill, knowledge and years of experience, they also possess the enthusiasm required for the job. That’s why smart sensors or robots, no matter how smart, can’t grow peonies. But nonetheless we’re strong believers in modern technology to help streamline the growing process. So we actively look at innovative methods that improve the quality if our peonies and get them to our clients faster. One technological innovation we’re pretty excited about is long range connectivity, or LoRa. With LoRa, sensors in the field are able to transmit data across great distances to a central system. Currently we’re trying out LoRa scanning at the nursery of Jacob Karsten, an innovator in his own right. Camera’s and smart sensor arrays measure, among other things, peony growth (size and colour), humidity, temperature, weather type and air quality. All this data, analysed in real-time, offers an incredible insight into the peonies’ growth. We don’t know how every factors interrelates yet, but we’re making progress. By better understanding how the environment influences the growing process, on a level of detail that’s hard to spot with the naked eye, we’ll be able to greatly optimise the growing process. There’s a lot of innovation happening in peony cultivation, and it’s thrilling to think about all the possibilities! Now is the first time it’s possible to do real-time, around-the-clock collection and analysis of growth data in the field, and we’re still taking baby steps. But we’re already confident that our expert growers, with their years of experience, will find great ways to apply this new technology in their work.